Above - The Duke of Yorks Picturehouse Cinema, Brighton in July 2008 - Courtesy Stephen Ashby. 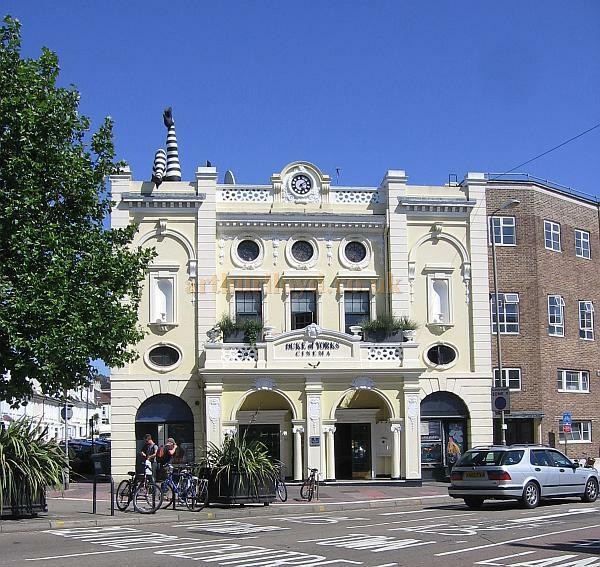 The Duke of Yorks Picturehouse was opened by the mayor of Brighton, Alderman Edward Geere, on the 22nd of September 1910 as the Duke of Yorks Theatre, and has been in continuous operation ever since. The Theatre was built at a cost of £3,000 by Clayton & Black and designed by their in house architect C. E. Clayton. The Theatre was built on the site of a former brewery called the Amber Ale Brewery and some of its walls were incorporated into the rear part of the Theatre's auditorium. Although originally named the Duke of Yorks Theatre it was actually built as a Cinema, one of the first purpose built Cinemas in the world, and even today the Duke of Yorks remains much in its original form. On its opening the Theatre boasted a carpeted auditorium with tip up seats for 800. The Duke of Yorks was named after the Duke of Yorks Theatre in London whose original owners were Frank and Melnotte Wyatt, Mrs. Melnotte Wyatt was the first proprietor of the Duke of Yorks in Brighton, however she sold the building to Jack Channon of Sussex Picturedomes in 1918. In 1930 the Theatre was equipped for sound projection and in 1937 the Theatre was closed for a complete refurbishment and its seating capacity was reduced to 750. It reopened on the 27th of June 1937. In 1956 Cinemascope was installed in the Theatre with a screen size of 28 feet by 12 feet but by the 1970s the Cinema had gone the way of so many around the country and been converted for Bingo, and even the occasional wrestling match. However, this was to be short lived and by 1979 the Theatre was transformed into an Art House Cinema. In this guise the Theatre had several short closures and changes of ownership but continued more or less in the same vain until it was bought by the Penultimate Picture Palace Company who refurbished the building and reduced the capacity to just 302. In 1994 the Theatre was sold again, this time to City Screen who have been running the Theatre as part of their Picturehouse Circuit ever since. The Duke of Yorks is now a very popular and successful Cinema showing Art House and Classic Films with the occasional 'First Run' feature, and is also the home of the local Brighton Film Festival. The Theatre is said to be the oldest surviving purpose built Cinema in Britain and is Grade II Listed. You may like to visit the website of the Duke of Yorks Picturehouse here.